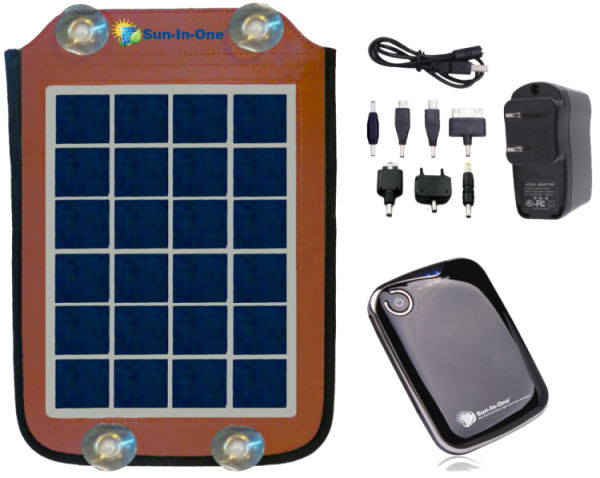 The Sun-In-One™ Portable Solar Charger and Power Pack 5200 provides the ability to fully recharge your cell phone, iphone/ipad/ipod, MP3/MP4 or other small digital devices whose input is 5V/1A, in as little as 1.5 hours up to 4 times a day from just one full battery charge. It can also charge an ipad or tablet up to 50%. The 5200mAh rechargeable battery can be fully recharged by a Sun-In-One™ Solar Panel in as little as 6 hours of sunlight or by plugging the AC adapter into an outlet, via USB into a computer, or into a car charger. Emergency power for your devices when you need it. The Sun-In-One™ Portable Power Pack 5200 is perfect for business travelers, salespersons on the go, electricians, carpenters and other tradesmen without access to outlets, even home owners who’ve lost power in a storm. The 5200mAh battery is lightweight and compact, and easily fits in a pocket or purse. An AC adapter, Mini and Micro USB plugs and a variety of charging outputs to accommodate most cellular phones are included. With the Sun-In-One™ Portable Power Pack 5200 you will never run out of power again when you need it the most!